Last week I was feeling sorry for myself. Nothing major or particularly traumatic had occurred...I was just a pretty lucky white girl feeling sorry for herself. As I was puttering around the interwebs, including that infernal Facebook, I saw a name which belongs to a person living far away from me and with challenges I can't fathom. Jhamak Kumari Ghimire. This woman is amazing. And she made me feel like a complete schlub and now I'd like to allow her to make you feel just as schlubby. 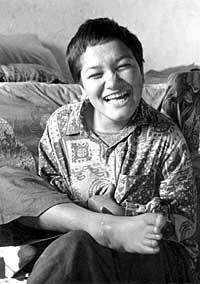 Let me set the stage for you: Jhamak Kumari was born in Nepal with cerebral palsy. She has slurred speech, limited movement in general and no control over her arms. When she was seven her father was advised to drown her in a river. In fact, according to the New York-based advocacy group Human Rights Watch, “disabled children are frequently denied access to education in Nepal and suffer abuse and neglect in their communities.” Jhamak Kumari’s family wasn’t a clan of awful monsters, although they did (reportedly) beat her on occasion. At some point they saw through her limitations to the brilliant mind inside and enterprising spirit trapped within the body. In eventually loving her and accepting her as their child they allowed her to grow and it’s a pretty good thing. She has won Nepal’s most prestigious literary prize, the “Madan Puraskar” prize, for her book of autobiographical essays, "Is life a thorn or a flower?" And she has written it with her foot. Yeah that’s right. HER FOOT. Suddenly my woes of not having the black crushed velvet jacket that I want seem a little ridiculous. The level of intensity with which I am pouring over nonsensical political “business” seems, for a just a moment (however brief) a little silly. My fervent consternation about the appalling lack of parking at my favorite restaurant is downright asinine. A woman whose community wanted her drowned, whose body traps her, found a way to communicate what’s inside her heart and mind…with her foot. By herself. Practicing until she was bleeding. What was that again about a crushed velvet jacket? Here’s an excerpt of one of her poems detailing her view of how senseless modern society can be. WHAT IS THE INTERPRETATION OF THE NEW MILLENNIUM? What is the interpretation of this age? >>>Read the full poem here. I have had to lay aside my woes and my perceived problems for a moment, and determine that I am NOT living up to my fullest potential. There is more for me to do and more for me to accomplish in this body and mind of mine. I know that problems are relative and it's not particularly fair to compare a suburban white girl with a woman in Nepal who's overcome the limitations of cerebral palsy...but screw it. I'm doing it anyway. Because once again I find myself in desperate need of a shove off my complacent tookus. (Tookus is British slang for the backside; the buttocks.) I need to stop neglecting the voice inside me that wants to get louder and bolder and I need to grow it. So, reader, what’s inside you? What are you drowning out, ignoring, neglecting and mistreating? If a child in Nepal (who might well have been murdered) could survive, despite being locked inside her body, to blossom into a woman who could bring these words to the world and receive her nation's highest literary honor…what can you do? Shove off, flex your feet, and get to it. I love reading stories like this. Thank you! I also love works like "schlub", which I am going to borrow. Thanks for "schlub" and "schlubby"! You are more than welcome, Van.